Preface: This paper has been edited with K. Wilson for inclusion in the Expanding Earth Knowledge Website, www.eearthk.com. For the last four decades, geoscientists have been constrained to understand and explain their findings in the context of a constant size earth, within the Plate Tectonics (PT) model, with need of applying PT mechanisms. The PT model is an hypothesis based on not thoroughly tested assumptions that has not allowed for alternative positions. This paper presents mechanisms that conform to the Expanding Earth model as postulated by S.W. Carey and many others, and can also be known as“Vertical Tectonics”. It should be realized that numerous papers and books disagreeing with the PT model do not get published, or made available through libraries, due to the exclusionary practices of the “peer review” system. Further explanation of vertical tectonics, Hydridics, metallic crystal lattices, high-energy endogeny, hydrogen effects within intermetals, and Larin’s work can be found in greater detail in the books made available from Polar Publishing, www.polarpublishing.com. The following should be understood with this clearly in mind. In this paper, I propose a new theory for the nature of the earth that is radically different from the conventional view. The conventional view, within the Plate Tectonics model, comprises a hot iron core surrounded by a rocky mantle and that surrounded by a rocky crust. Interior heat is thought to be residual primordial heat supplemented only by a small amount of radioactive decay in the crust. Earthquakes in the upper mantle and lower crust, are interpreted as shear stress release events with slippage on pre-existing fractures. Volcanic activity and magmatism are attributed to the escape of heat from the interior or to melting due to pressure effects. I regard this view as inadequate for failing to take into account the fact of hydrogen’s abundance in the planetary makeup and its astonishing properties, which are not generally understood. The Dual Geospheres view brings the importance of hydrogen into focus. If the earth primordially was entirely dominated by hydrogen, the gradual escape of hydrogen to space would have led to the oxidized carapace (crust; lithosphere) and the ocean and oxidic atmosphere, while leaving the interior still hydrogen-dominated. This is the picture today, an earth in which the contact between the outer, crustal, geosphere and the inner, hydridic, geosphere is the zone in which endogeny (force produced from within) originates. To understand why hydrogen is so important, one must know that hydrogen nucleii (without electrons) under mantle-depth pressures are able to penetrate metal atoms and thus transmute and densify them. Pressure reduction leads to escape of hydrogen and de-densification. Conceptually, density changes with consequential volume changes at sub-crustal levels can be set in motion by polar shift, erosion, sedimentation, volcanic exhalation, meteoritic or other mass shifting events and explain the frequent events of endogeny at those levels. The body of primordial earth and the primitive atmosphere, both dominated by hydrogen, evolved the crust and modern atmosphere and hydrosphere over geological time through the known process of hydrogen escaping the gravitational field of the planet due to its small weight. This left residual metal oxides as a crustal carapace over the hydridic (hydrogen-impregnated “intermetallic”) interior and residual non-metal oxides accumulated as oceans. Molecular gases were left behind as the oxidic atmosphere. The modern earth can thus be seen as having a mobile interior of highly-reduced metal hydrides surrounded by a rigid lithosphere of metal and non-metal oxides and heavy gases. The core is not likely to be mainly iron, but rather a mixture of high-pressure metal hydrides. Its solid aspect being due to a phase change based mainly on pressure. Because endogeny is caused by endothermic (absorption of heat)chemical reactions, the crustal heat gradient cannot be extrapolated below the crust-mantle contact; and thus the core may not be very hot. Density and densification through hydride behavior can be taken as the key to endogeny. Whereas porosity is usually thought of as empty space, this is never the case. Rather, porosity is space occupied by any material that is less dense than surrounding material. Thus, a mass in the interior that becomes de-densified becomes buoyant, isostatically positive, and rises as a plume while the surrounding mass subsides to fill the vacated space. By this definition, plume volume is porosity. Plumes can ascend in the mantle and into the lithosphere until they reach oxidizing conditions and their hydrides dissociate or oxidize with release of latent chemical energy, thus initiating magmatism, earthquakes, volcanism, and replacement mineralization. Secondary effects such as mountain building, subsidence, and rifting follow. In this way hydride dissociation and oxidation created the lithosphere and continue to expand it. The lithosphere is then a global carapace above a fluidic, hydridic, and steadily degassing inner geosphere. The lithosphere, atmosphere, and hydrosphere comprise an outer geosphere that has been incrementally built through geological time as hydrogen escaped into space. It is interesting to note that atmospheric evolution has been long-recognized through paleontology in the evolution of the primitive, hydrogen-tolerant prokaryotes into oxygen-tolerant eukaryotes by late Archean (2.5BYA) time. 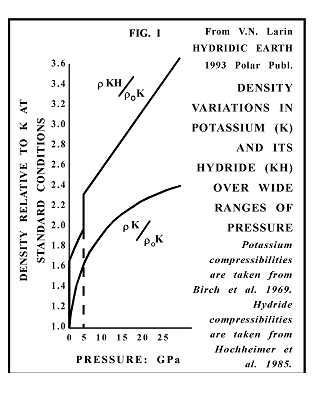 Figure I shows the densification of potassium (K) in a hydrogen atmosphere as contrasted with its compressive behavior without an atmosphere. Hydrogen in State I is virtually “sucked”into crystalline metal. Metal density increases to 1.7 times original density with atmospheric pressure remaining unchanged. In State II, increasing pressure forces hydrogen to be adsorbed in the metal lattice, but still retaining its electron. State III starts at a critical pressure of about 5 Gpa (Giga-Pascal’s, 5000 atmospheres of pressure) with density 1.95 times original density. In this stage hydrogen atoms shed their electrons to make covalent bonds with metal atoms. Once again, as in State I, there is density increase, up to 2.3 times original density, without pressure increase. State IV, the ionic hydride stage, in which hydrogen nucleii are forced inside the electron rings of the potassium metal, commences with pressure still about 5 Gpa. A linear relationship of increasing density and pressure is then maintained to the limit of the equipment, where the original potassium density has about tripled at a pressure of 29 Gpa. 33% of the final mass is added hydrogen; 39% is potassium compaction; 28% is original potassium mass. The upper limit of this linear relationship is not known. States III and IV hydrides have a geologically very important property, fluidity. Larin showed the writer an example of this with titanium. He had set a ruby in a matrix of titanium metal, a remarkable feat, because titanium has such a low heat conductivity that milling causes the metal to spall(chip, and crumble). For practical purposes titanium cannot be milled. Larin, however, had fluidized the titanium to a paste-like ductility by hydrogen impregnation, after which the ruby was easily embedded in the still-plastic matrix. Reduced pressure had allowed the hydrogen to escape, and the ruby was left firmly set in crystalline titanium metal. The insertion of atomic nucleii into metal atoms to create the ionic hydrides of State IV has the effect of transforming the atoms from elements defined by so many protons, neutrons, and electrons into”intermetals”(Larin’s terminology). The 5-Gpa critical pressure where potassium is fluidized is approximately the pressure at the base of continental crust. Non-metal hydrides (H2O, HCl, NH4 etc.) as well as the hydrides of the transition elements, carbon and silicon (CH4, SiH4), are all characteristically fluids at much lower pressures than 5 Gpa. Whether they, like metals, also become intermetals at high pressures is uncertain to the author. What is clear, however, is that the phenomenon of nuclear injection must be a general condition for metals that occur with abundant hydrogen in the inner geosphere. This author’s field research in 1986 (described in books, Environment of Violence and Expanding Geospheres (2)(3)) had led him to the Gros Brukkaros crater, a 3-km diameter caldera with siliceous breccia walls (rock consolidated from fractured older rock, usually showing imbedded sharp fragments) situated on a welt on the crystalline South African shield in Namibia. The volcano is remarkable not only because of its situation on a Precambrian (>500MA) shield, but also because there is a total absence of volcanic ash or tephra (ejected solid material). Only volatiles plus the silicified breccia in the walls must have been emitted. But what gas could have been stored and hidden within the solid Earth in quantities sufficient to provide the huge flow necessary to open a 3-km vent? The author’s conclusion was that, among possible gases, only hydrogen has the capability of penetrating rock fabrics so as to be effectively hidden within the Earth in quantities anywhere close to the requirements for that volcano. Hence the conclusion that hydrogen must be a major component of the inner Earth. When writing about the African volcano, the author was unaware of Larin’s hydrogen research that clearly demonstrates the potential for gas sequestration in the Earth. Thus, the concept that Gros Brukkaros was opened by hydrogen is bolstered greatly by Larin’s research. New data supporting the idea of hydrides in the interior comes from the world’s deepest borehole, the Russian Kola Super-Deep Borehole KSDB. 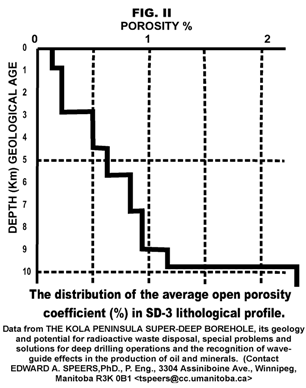 From a compendium of scientific data on the borehole the lead author, Academician Kouznetsov(4), has kindly provided Figure II, which shows, counter-intuitively, an exponential increase of rock porosity with depth. Among metal hydrides in the core, silicon (Si) should dominate the mixture, as it is the third most abundant element on Earth. The low silicon density would give it differential buoyancy among metals; and the ability to form both hydrides and oxides would make it a chemical arbiter between the reduced interior geosphere dominated by the Earth’s most abundant element, hydrogen (H), and the exterior geosphere dominated by the second most abundant element, oxygen (O). Hydrides in the core (Si + Na, K, Ca, Mg, Fe, Ti, etc.) with an average density near that of iron, being fluidic, should fractionate on the basis of relative mass and ascend as plumes through the mantle. Their mass movement within the body of the Earth would affect its rotation and explain polar wander(5). On reaching levels of decreased pressure in the upper mantle and lower crust, ionic hydrogen would escape as molecular hydrogen and molecular gases, silane (SiH4) and methane (CH4) in particular. The assorted gases would continue to rise buoyantly in the crust, permeating available porosity. 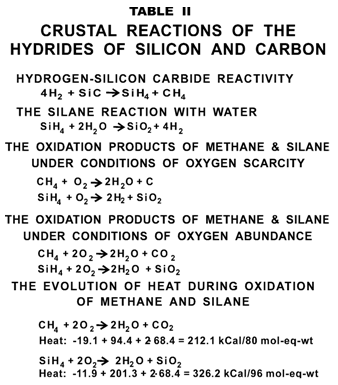 Where water was encountered, silane would react, depositing silica and releasing molecular hydrogen and heat. If silane reached levels where free oxygen is present, it would react explosively, producing silica (SiO2), water, and heat. These reactions generate and define endogeny (force produced from within), their silicon furnishing the basis for continental shields and lithosphere generally. Appropriately in passing, the similarities and differences between the hydride gases of carbon and silicon should be noted. Methane (CH4 ) and silane (SiH4) are similarly volatile, combustible, andendowed with latent heat (Table II). Two crucial differences should be noted. First, whereas silane is destroyed on first contact with water or oxygen in the crust, methane continues to migrate upward toward the surface. The second difference is that the products of combustion contrast starkly: methane only yields gases when burned (H2O and CO2); silane gives off gas and solid silica (H2O and SiO2). The zone where high-pressured hydrides, (of light elements, Si, Na, K, Ca, Mg, Ti, etc.) from the interior meet the oxygen-dominated rocks and water of the exterior is a battleground between very different geological regimes. Hydrides from the inner-Earth are charged with energy and thus the consistent losers in the battle as metal deposits and rock-forming minerals are created or transformed to lower energy states. Hydrogen is relocated from ionic to molecular forms. Heat is liberated with various levels of violence. Pressured volatiles open fractures in oxidic rock, dislocating adjacent blocks of country rock with earthquake effects. Heat released in the oxidation of ambient hydrides melts country rock to magma. Magma wells upward before crystallizing as plutons (rock crystallized from subsurface magma), dikes or sills, or emerging on the surface as lava. Free hydrogen from the interior that is present in the hydride plumes is supplemented by hydrogen released in the contact zone between the geospheres. Where this hydrogen moves laterally and pervades rock adjacent to a rising plume, it densifies the pervaded rock. Densification triggers negative isostasy (landmass suppression), regional subsidence, and takes the form of a rift, graben, or oceanic trench. Thus, the effects of hydride behavior at the contact between the geospheres include all processes of global tectonics, volcanism, earthquakes, quiescent metasomatism, magmatism, isostatic adjustment, crustal heating, and polar wander. Where the hydrides of the inner Earth meet the oxides of the upper mantle and crust, tectonism originates and the twofold division of the planet is defined. Each geosphere has its subdivisions based on phase differences. The envelopes of ocean water and atmosphere are phases of the outer geosphere. The liquid outer layer of the core is a phase of the inner geosphere. The essential dichotomy of two geospheres devolves from the gross chemical and physical incompatibility of hydrides and oxides. Reducing vs. oxidizing, high density vs. low density, fluidity vs. rigidity, even liveliness vs. immobility, are all stark contrasts. Life-like behavior hardly characterizes geological features, but the analogy of mobile hydrides versus rocks with their immobilized hydrogen symbolizes life-like behavior versus death-like behavior (entropy). Returning to the porosity that increases with depth in the Kola borehole, porosity is space filled with a fluid of less dense material than its surroundings. A requisite for the buoyancy of volatile hydrides from the interior is that they be less dense than their surroundings. Hydride plumes reaching the rocky upper mantle and crust pervade stress-created micro-fractures in preexisting rock. Micro-fracturing is caused by the daily flexing of the lithosphere by tidal forces. Within the micro-fractures, volatile hydrides (H2,H2O,CH4,SiH4,NH3,HCl,etc) react with water and rock minerals, thus transferring mass and energy from inner to outer geosphere. Silanes (SiH4) in particular deliver the silicon for rock formation as well as the energy for endogeny. Mass transfer creates new crust and tends to re-seal open fractures. In this manner hydrides create and preserve the carapace above the gas-pervaded, porous underworld (a term from Greek mythology that is not inappropriate!). Increased interior porosity under the carapace is an essential feature of the dichotomy of dual geospheres. Continents must be situated above maximal hydride plume activity; they represent the thickest developments of carapace, and necessarily the most micro-fractured regions in the rocky carapace that rests on ductile mantle. Daily tidal strains open and close micro-fractures, admitting and occluding volatiles migrating from below. The author observed this in the Archean Granite 7-32-89-10 well drilled to a depth 1100 meters (3,600 feet) into pink, charnockite granite basement in northeastern Alberta, Canada. The granite contains fluid inclusions of gases (mainly hydrocarbons) encapsulated in siliceous deposits and reformed, crystalline feldspars and quartz on myriad micro-fractures. This well only penetrated the top of the carapace, which at deeper levels should be more fractured and porous, as demonstrated in the Kola borehole. At still deeper levels, beneath the zone of hydride dissociation and oxidation, porosity within plumes should be high, but temperatures should decline due to absence of reactions. The deep interior of the planet, below the reaction zone where crustal heat is released in chemical reactions, may not be hot at all, but relatively cool. Hydride reactions at the transition between inner and outer geospheres are primarily molecular hydride reactions with water; and these should not be confused with the reactions with free oxygen, which can only occur near the surface. If silane (SiH4) breaks into a quiescent volcanic vent filled with air, a detonation and fiery effluence follow. This is the scenario reported by witnesses of the Krakatoa and Tambora volcanic events of the 19th century: an enormous explosion, a column of fire, and a rain of siliceous ash from a mushroom cloud. Where, on the other hand, silane (SiH4) enters a conduit without oxygen, the silane reaction with water produces siliceous ash, heat, and hydrogen gas, but without the initial detonation. At the surface the hydrogen ignites and results in a fiery eruption that is indistinguishable from the previously mentioned detonated eruption. In both cases, a column of fire and a rain of volcanic ash from a mushroom cloud make the spectacle. Large volcanic convulsions of fire, ash, and vapor appear intuitively to be too energy-intensive to be explained without a chemical reaction of combustible gas. Among combustible gases, methane, andhydrogen sulphide are widely recognized as components in volcanic eruptions. They produce heat on combustion, but not the ash that silane can produce. The arguments for silane then, are that the great blankets of siliceous ash observed worldwide require silane to explain their provenance and correspondingly large releases of energy to emplace them. Other metal hydrides in the silane-dominated effusion can provide the complement of minor metals found in ash and tephra, but only silane can produce the requisite silicon. The common argument against the silane (SiH4) explanation is that silane gas has never been detected in volcano sampling. This argument is specious because silane’s explosiveness on contact with oxygen precludes its detection or recovery. On the other hand, if the worldwide blankets of ash had been exhumed from crust or mantle beneath their vents, the vents should sit in great troughs of collapse. The exact opposite is observed. Volcanic vents are usually arrayed on raised platforms in belts of volcanic mountains. Thus, energy release, siliceous ash, and detonations are prima facie evidence that silanes energize phreatic, fiery volcanism. Molecular hydrogen (H2), water (H2O), methane (CH4), and ammonia (NH3) are gases that escape into the atmosphere from the crust. In the upper atmosphere they are vulnerable to dissociation by the solar wind, whence the hydrogen fraction escapes the Earth’s gravitational field. Residual oxygen and nitrogen are left to dominate the atmosphere. The carbon and some of the oxygen sooner or later are precipitated and end up as igneous or sedimentary rock on the seafloor or within the lithosphere. The copious water that escapes the crust, if not dissociated in the upper atmosphere, descends to accumulate in oceans. A key to when the outer geosphere developed is given in the evolution of living cells. The early Archean (~3.5BYA)”prokaryote” biota was only adapted to a world deficient in atmospheric oxygen. By later Archean (~2.5BYA) time,to survive in the newly oxidic atmosphere and ocean, the “prokaryotes” were forced to evolve by developing the intracellular mitochondria of the subsequent “eukaryote” biota. This transition from adaptability within a reducing environment to adaptability within an oxidic environment implies that the Earth was hydridic (with H2, H2O, CH4, NH3, HCl, etc) at the surface well into Archeantime and that the reducing, hydridic regime now only found in the planetary interior was the environment of original life on or near the surface. From its inception in late Archean time, the oxidic outer geosphere has been enlarged, layer by layer, an idea first advanced by E.A. Skobelin (in Hunt et al.iii). As in an archeological dig, the outer geosphere of upper mantle, crust, oceans, and atmosphere is a carapace that has grown throughout 2.5 billion years of geological time. The proposed dual geospheres theory of the Earth is a dichotomy, an interior geosphere or underworld, of energy-rich hydrides and an outer geosphere or carapace of energy-poor oxides. Hydrides are fluidic, mobile, and capable of being squeezed and forced to migrate. Fluidity allows metal hydrides to fractionate. Plumes of less dense fractions ascend upward into the oxide zone, where lesser pressures and water cause hydride dissociation and oxidation with heat emission. Magmas, lavas, pyroclastics, and granites, rocks of lesser density and greater volume than those of the underlying mantle, are created. Less-dense terranes are raised as continents above surrounding landscapes and seascapes while at the same time adjacent terranes are densified by hydrogen permeation and subside as rifts, grabens, and oceanic trenches. The effects of hydride behavior include all processes of global tectonics, volcanism, earthquakes, quiescent metasomatism, isostatic adjustment, polar wander, and generation of crustal heat; all being forms of tectonism that originates in the transition zone between the hydrogen-pervaded inner Earth, where hydrogen nucleii reside at high pressure within the electron shells of metals and the oxygen-dominated outer Earth, where the hydrogen has separated from atomic shells. The fundamental dualism in Earth structure is established by the contrasting density and energy of the Earth’s hydridic inner and oxidic outer geospheres. (4) Kouznetsov, Youri, Academician, 2000, diagram from composition in progress of: The Kola Peninsula Super deep Borehole; its geology and potential for radioactive waste disposal, special problems and solutions for deep drilling operations, and the recognition of waveguide effects in the production of oil and minerals.